Bourdain & Spade - Two Tragedies in One Week | Lawrence & Co.
Wow, last week was a rough week. I was in Dubai when I heard the shocking news – twice. It is shocking when someone you know, or know of, dies – even more so when they decide to end their own life. I did not know Kate Spade or Anthony Bourdain personally, but I know and admire what they accomplished in this world. I did not know their pain nor their struggles, but I know the stories and struggles that others experience who are making their own big impact on this world. I do not know their logic for ending their lives, but know it would have been logical to them. I’ll never forget the moment when I was 7 years old and learned that Elvis Presley had left the building. I became obsessed with understanding why and have been trying to understand how people that have it all by Western Standards decide that life is no longer worth living. As a kid it made no sense to me – and as a teen and young adult I was still perplexed. My new book, Your Oxygen Mask First, was inspired by watching and learning from the struggles that highly motivated and successful people have as they make a big impact on the world. Unfortunately the impact back on them can be devastating. As I watched Kurt Kobain, Michael Jackson, Amy Winehouse, Robin Williams and others all quit the game of life, it astounded me. I judged them. I saw them as weak and cowardly. I did not understand. 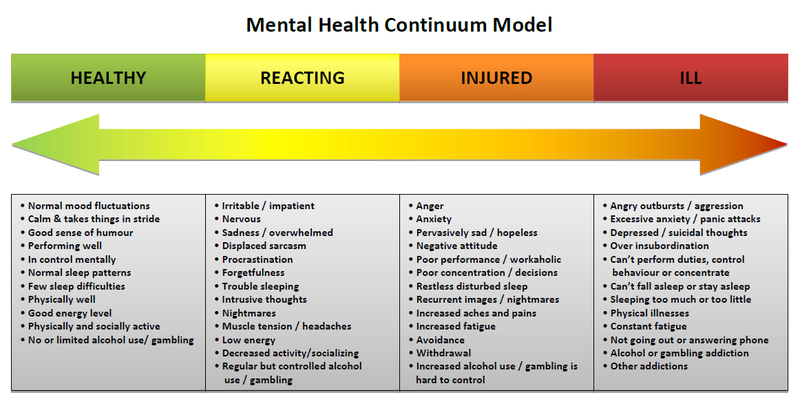 Finally, a few years ago I was introduced to something called the Mental Health Continuum and how all people move between zones: Green (healthy), Yellow, Orange and Red (very ill). There are different symptoms in each zone that people will experience and/or exhibit. What I now understand is that the pains and challenges of life (which we all experience on a regular basis) can take their toll on us and weaken our mental state. This happens to everyone. And, when we have a few very impactful things hit us hard at once, we can (predictably) slip into a really bad place. For some, that bad place gets worse and worse until it is unbearable. They lose faith that it will get better – ever. This is the deep dark red zone of mental health. Unfortunately, when we lose faith in our ability to regain our mental health and well-being, we are mistaken. But, we are in such a bad place that we can’t see that. Since my awareness of Mental Health triggers and symptoms, it is much, much easier to see this with the CEOs and Leaders that I work with every day. I now know the importance of talking about Mental Health (and the Continuum) and what to watch out for and what to do. I have discovered that in doing so, more honest conversations are happening. The most shocking part is some of the most successful, high-achieving people that I work with are just as susceptible to getting worn out and knocked down mentally. These are the smartest, strongest and most resilient people on the planet. If they can get worn down and into the Orange and Red zones mentally – all of us can. My current belief is that the harder you push and more you achieve on this planet, the more likely you are to crack mentally – at least a few times in life. It’s better to be prepared for an incident than live in denial until you find yourself in a mess and are unsure (or unclear) of what to do. Best to be aware and prepared. Understand Mental Health and the Mental Health Continuum. Have a plan of what to do when things get bad or weird – the answer is always to seek the help of a professional such as a psychologist. You would not try to fix a compound fracture yourself, so don’t think you can be of much assistance with a mental health issue either. When you start to slip mentally, talk to someone about it. Life is beautiful and always will be. The challenge, is that when we get knocked down by life and don’t easily get back up again, our mental state gets affected. And without a lot of the right assistance, life can go from beautiful to bleak…in our minds. It’s not that the world actually changes, but our internal world and perception of the external realities does. In the end, we can’t control the actions and beliefs of others. What we can do is ensure that we provide the best support and resources to those that we know need it. Sometimes, that is ourselves! Make it a great week. Today has the potential to be a great day. If you are in a rough patch mentally, know you are not alone and talk to someone about it. If you are in a really rough place, talk to a doctor to help you find a psychologist. If you are in a great place, think of those around you and who might benefit from a chat and some extra support today. Download the First Chapter of our New Book. to survive and thrive in business, and in life.